So you've got a killer idea for a business? That's great. But if you want to skate through life on the quality of your ideas, you'll have to get in line. Everyone would like to turn their concepts into profits while putting in minimum effort, but it rarely works out that way. In most cases, an idea's success is tethered to the person or people who believe in it. If those parties understand how to turn their concept into something tangible, they could eventually realize their dreams. But there are a lot of steps between points A and B, and a lot of obstacles and demands must be faced. 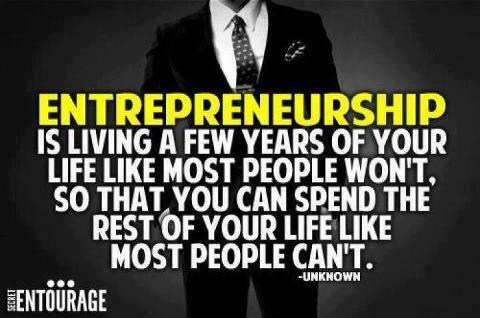 It takes more than an entrepreneurial spirit to build a business. Multiple sacrifices must be made, and in the end your business concept needs to be flexible to adapt to changes in circumstances. Many of the world's most famous entrepreneurs make founding and running multi-billion dollar companies look easy, but that's often the end result of years of hard work without any promise of a payoff. If you are serious about committing yourself to entrepreneurship, you need to be ready to pour everything you have into it. That won't guarantee success, but it can go a long way. Any entrepreneur needs to understand the stakes of starting their own business. They also need to know how much they're willing to give to achieve success. How long can you live without an income? How much can you afford to put into your business? How important is family time, and how do you plan to address your personal needs? Unfortunately, life as an entrepreneur is rough. Running a business isn't a nine-to-five job. As the head of the company, your job is to make sure things get done, no matter what the personal or financial costs. If that means missing your daughter's soccer game to do it, so be it. Not everyone is willing to make that sacrifice. There's no shame in that, but it's critical to recognize those limits before you commit yourself, your finances and your family to achieving your dream. Adapting on the fly is key. No matter what you do on your end, there's no assurance that a long line of customers will be chomping at the bit to scoop up your products and/or services. Maybe you're not looking in the right places. You may have had one target demographic in mind, but if your first efforts don't yield any success, you might pivot by expanding your borders or going beyond them. Globalization has been a boon to many companies that have expanded their consumer base by expanding their marketing efforts to new communities, regions, countries and continents. The same technology makes Skype interviews and global conference calls a normal part of business expansion in the 21st century. Even if your initial disappointing performance has you down, it could be that you just haven't found the right consumer base to establish and grow your business. Continue to make adjustments to your marketing tactics, target market and demographics to see if you've simply miscalculated where your services will be most valued. Last but not least, entrepreneurs need to tap every ounce of patience they can manage if they want to survive the startup phase of their business. Success may not come quickly, and it may not be easy, but being impulsive and/or reactionary is a recipe for disaster. Don't forget the time you've taken to develop your product. If you give up you're tossing away the time, energy and resources that you've invested. Keep pushing.